Seen the new poster of Anushka Sharma's Pari yet? Well, beware, the new poster of the film is not for the faint hearted. 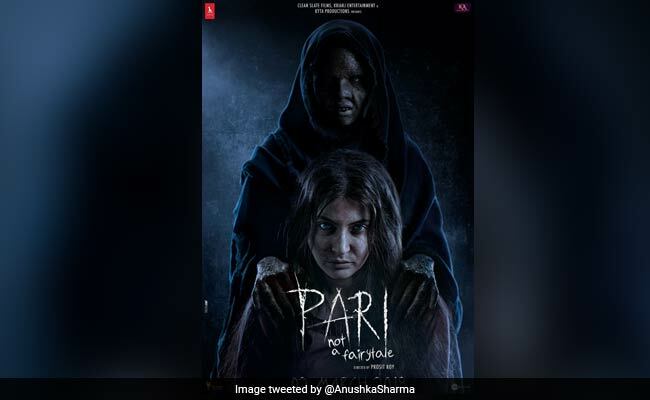 "Pari not a fairytale," is what perhaps best describes the new poster of the film, which features Anushka Sharma and the creepy demonic creature. The poster is scary as heck. In the poster, Anushka is seen sitting while the uncanny creature comfortably keeps its hands on Anushka's shoulders. The teaser of Pari was released yesterday and also revealed the new release date of the movie - earlier the film was supposed to hit screens on February 9 but now has been rescheduled to arrive in theatres on March 2. Warning: If you still think you're brave enough, then see this. Anushka Sharma recently shared her first look from Pari. Within just few hours, #PariFirstLook, started trending on Twitter. Anushka looked unrecognisable in the haunting poster amidst a blue background. Pari is Anushka's third film as producer (Clean Slate Films) after 2015's critically acclaimed NH10 and last year's Phillauri, which wasn't as successful as NH10. Last seen in Phillauri, Anushka is currently filming the Aanand L Rai movie Zero, co-starring Shah Rukh Khan and Katrina Kaif. Anushka Sharma married Virat Kohli at a destination wedding in Italy on December 11 last year, and rounded off her wedding festivities with a Mumbai reception on December 27. She recently touched down in Mumbai after accompanying Virat Kohli on his South Africa trip for a while.